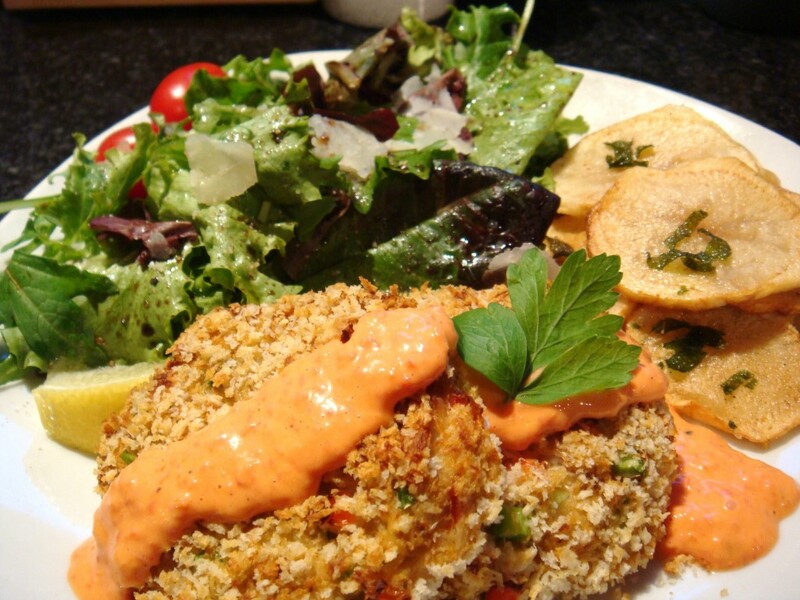 And last, but certainly not least… Father’s Day DINNER: Baked Crab Cakes with Red Pepper Aioli Sauce and a side of Homemade Potato Chips! 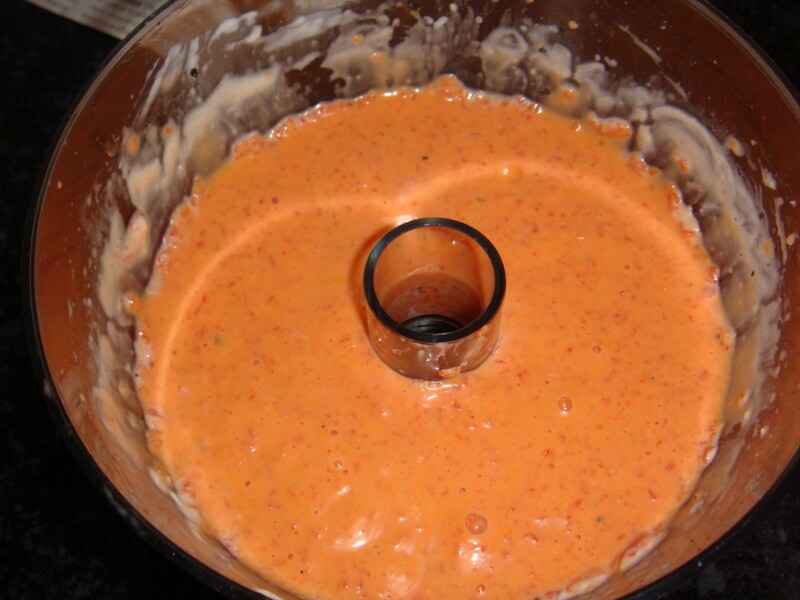 Place all ingredients in a food processory and blend until smooth. I refrigerated mine for a bit after, to help it set-up a bit (since it was lower in fat). 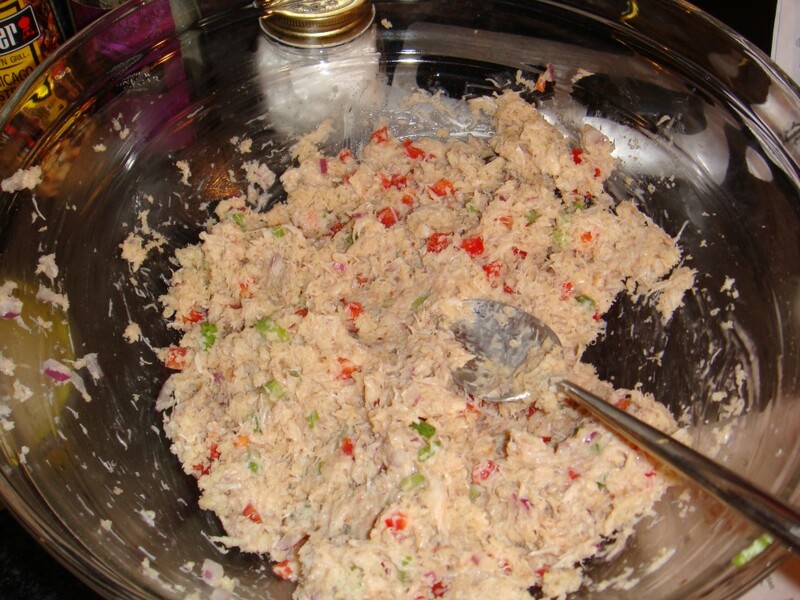 Combine 1/3 c mayo and next 6 ingredients (through crab) in a bowl. Add 3/4 c panko and stir until well combined. Form into 6 patties (I was able to make 8); dredge patties in remaining 1/2 c panko. **The original recipe calls fro heating 1 tbsp butter in large non-stick skillet over med-high heat, to cook the first 3 patties — taking approx. 10 minutes — until lightly browned** I baked 4 of the crab cakes in my toaster oven, at about 400 degrees for 10 minutes and then broiled them to brown them a little more. Essentially, you want the internal temperature to be 155 degrees F.
This recipe was taken from a cooking Cooking Light issue that was a few years old. 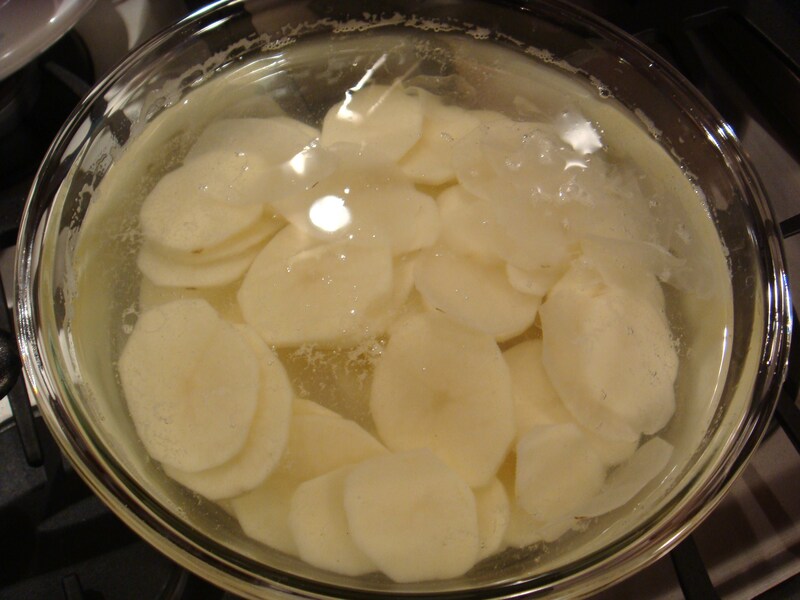 Using a food processor or mandolin, slice potatoes evenly. My first batch was very thin and my second batch was much thicker. The thin ones came out GREAT… but the 4-yo ate them all before I could take a pictures. The following pictures are of the thicker slices — I had pushed a little too hard on the potatoes when feeding them through the food processor. For thinner slices, press more lightly! Chiffonade 4 or 5 large sage leaves. Soak slices in cold water for at least 15-20 minutes. Remove from water and pat dry. You will notice the potatoes are much crisper now. In a cast iron pan, deep-fryer or heavy skillet, heat canola oil until hot. I’m sure there are guidelines for temperature… I just winged it. 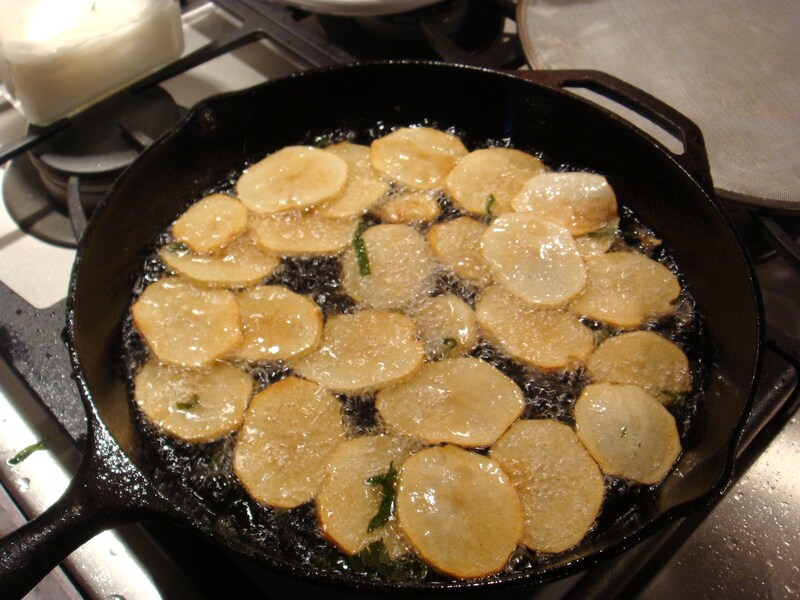 Carefully add potatoes using a slotted spoon or wok wire skimmer. Do not add too many slices at once, or they will not cook evenly. My two potatoes took 3 batches. 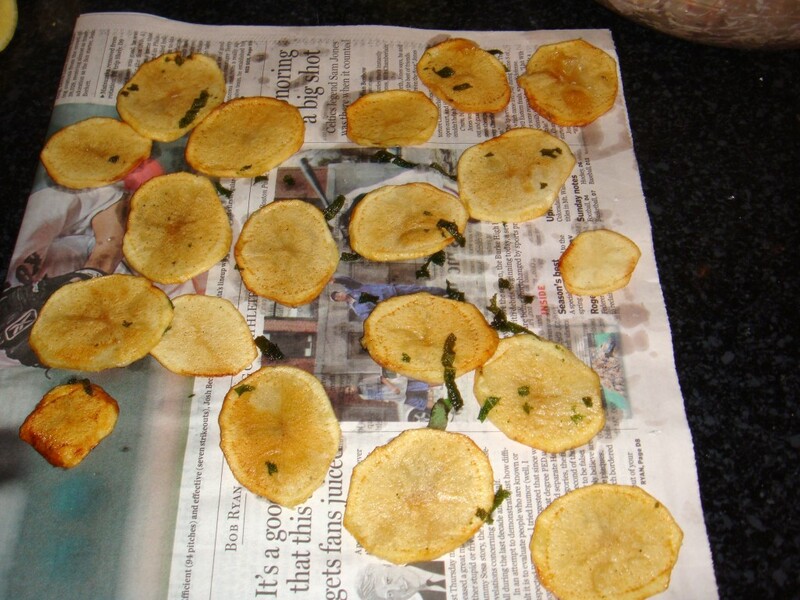 Add even amounts of sage leaves to each batch, to fry alongside the potatoes. As the potatoes turn golden brown, carefully turn them over. Continue deep-frying until browned to your liking. Remove with the slotted spoon and lay out (in single layer) on newspaper to drain. Season with salt to taste. Make sure you fish the sage out of the oil as well! I assmebled the dish with a small mesclun salad dressed with just a little olive oil, balsamic and some sea salt and fresh ground pepper. A great end to a Father’s Day full of food!